Don't you just love all the different projects you can create using SU! DSP? 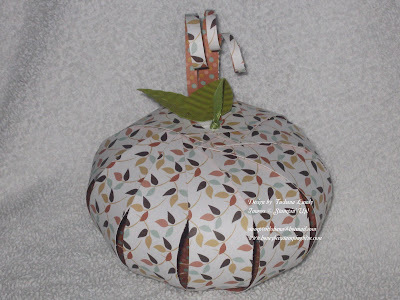 This paper pumpkin was made using the Autumn Vine Designer Series Paper found in the Mini Holiday Catalog. The leaves are made from Kiwi Kiss cardstock ran through the Paper Crimper.